1.Top up the pressure of the boiler or system using the internal filling loop if it is a combi boiler, otherwise using the external filling loop attached to the system. If you would like to know the correct pressure of the heating system see our page on Boiler Pressure . Also see instructions below on how to increase boiler pressure for vaillants. 2. The pressure sensor connection may have come out or become loose. Take the cable out, check it’s not broken and then re-insert back in. 3. Check that the pump connection is not loose. If necessary remove the connection from the connector, check and re-insert. In order to pressure a Vaillant boiler, see the following steps. Locate the filling loop. 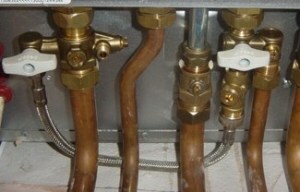 This may be the integrated type under the boiler or external to the boiler, usually on combi boilers, but still possible that it’s located on the pipes further below the boiler or another part of the system. Integrated Filling loop. Two white knobs. Turn them both to the open position to top up the system to the correct pressure, then turn both white knobs to the off position. External Filling loop. 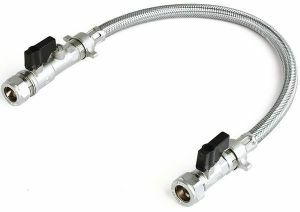 Usually 1 or 2 black knobs either side of a silver flexible hose, turn both to top up system. Finally, you may have to reset the boiler to clear F22 fault code, if topping up the pressure does not immediately cause the boiler to begin working. In most cases topping up the pressure is enough to bring it back online.